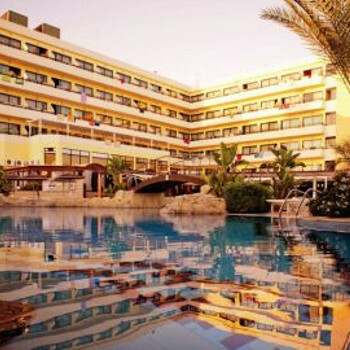 The Tasia Maris Beach hotel is located right next to the beach of the ever popular Ayia Napa. This hotel is geared towards the adult and couple market, so it’s a real getaway. The town of Nissi Beach is just a 15 minute walk away. We enjoyed our stay at the hotel albeit it was only for 2 nights. The location of the hotel is fantastic, rooms were clean, bedlinen was spotless, nice flat screen TV which had HDMI and USB ports - very useful if you want to take your add ons with you. 1)TV channels - the only English speaking channel was EuroNews, the remainder being Greek and the odd Russian channel (again, totally different than the Thomson Gold we stayed at in Paphos) which offered BBC and UK news. 3) Neither did the hotel provide tea & coffee making facilities in the room (which we got as part of the AI upgrade in Paphos). Rooms - nicely decorated but the hotel offers standard twin beds (3' 0") whereas the other Thomson Gold provides larger single beds (3' 6"). The sleep however was very comfortable and the rooms were quiet. The lighting in particular is very poor in the bathroom too and I wonder how many of the elderly residents with failing eyesight fared with this? The sink tap was "iffy" - it did not have a smooth action so you were in danger of spraying yourself each time because of the shallow sink. Don't get me wrong - it looked fantastic and would be a blessing in every household but for a hotel room there's a lack of places to put toiletries in the shower (a small metal contraption that does not allow the bottles to stand up on but lets the soap slop through the gaps is a complete waste of time). Obviously designed to look pleasant but a total disregard to functionality. We were located on the side of the hotel (same side as the entrance) and for us it was perfect giving shade through the latter part of the day and it was quiet. (Room 206). I read somewhere that people had complained about the hotel doors banging doors when closed and can only assume these were internal doors such as bathroom, wardrobes etc as we found the hotel room door was impossible to bang. It's on a fixed spring which slows it down but forces it closed (they are heavy) without banging - even with the balcony doors open. Food - we were surprised to find the AI lunch menu was taken from the A la Carte service but assume this is because not everyone is on All Inclusive basis and therefore reduces wastage. However, it did mean you could quite easily check the value or money on the upgraded food and beverage package! Evening dinner offered plenty of choice but we had issues with the seafood on both evenings. Mussels on the first night were not chilled enough which led my husband to worry about eating those he had on his plate. On the second night we found prawns on the buffet menu and again, they were not chilled or even cool and were "mushy". Needless to say, we decided it was better to avoid eating them which was a disappointment to my accompaniment of seafood/cocktail sauce! Breakfast was plentiful although I did find the placement of some of the fresh fruit a little "odd" with grapefruit segments appearing in the middle of cold meats and cheeses but orange segments and melon in 2 different places - one with cereals and the other with fruit salad and yoghurt. It was glorious to find the chef cooking fresh pancakes on our second morning as I'm so used to finding them pre-cooked, folded in three and going cold in a Baine Marie these days! All in all it was a pleasant stay and the hotel staff were very friendly. The entertainment of an evening was sufficient (for the acts brought in from outside). However, the resident duo (Family Affair) are lacking in charisma and let the side down. We would go again and stay in the same area and possibly the same hotel - but now we know more about it, we would be more prepared the next time! A couple of hundred euro for 2 nights / 3 days was quite acceptable (we upgraded to All Inclusive on arrival at â‚¬26 per person per night - but do feel that Thomson should look more to offering a more uniform provision of services overall in their accommodations between resorts. It was this that we found somewhat disappointing. We have reviewed the Tasia before and it was a top hotel this was our 13th visit and sorry to say our last, we feel the standards for a Gold hotel have slipped and put this down to A/I being offered now. The food quality has gone downhill and we were sick of pork on the menu every night. The pool area was never washed in the 14days we were there and areas where drinks has been spilled not washed dirty black patches everywhere. The entertainment supplied by Thomson’s was dire and the so called UK acts a total waste of time, we felt sorry for the daytime entertainment guys trying to work with the slop Thomson’s has given them to work with. Most of the long term return guests were of the same opinion as us the hotel is not of Gold standard now. On the upside the staff are top class and the hotel has had a small face lift in the lounge which gives it a more light modern feel. Our room was cleaned to a high standard. We will not return until the hotel gets the standards of 4/5yrs ago back. This hotel is Thomson Gold having stayed in Thomson Gold before I was disappointed in the hotel standard. 28 euro to hire a fridge for 10 days. You could upgrade to A/I but we felt it was rather expensive. Room towels and sheets looked washed out and should have been white but were grey. Food was ok nothing great fried and poached eggs most mornings were like golf balls. The lazy river was an overflow from the spa bath so don't be fooled by thinking there is a lazy river. We booked the Tasia Maris hotel as our friends who we were going with had been 3 years ago. They had a great time & said the entertainment was fantastic. So we booked superior rooms so we could sit on the balcony and watch. But what a big disappointment it was. The entertainment was not good at all. So we had to go elsewhere. The rest was good. Great meals, friendly staff, very clean, nice pool area. We would go back but only if the entertainment got better.